We make high quality, durable products that are guaranteed to be free of defects in materials and workmanship for the first five years of ownership. If you find that your product is defective due to a problem with our manufacture, we will replace/repair it free of charge, extremely quickly and hassle-free. 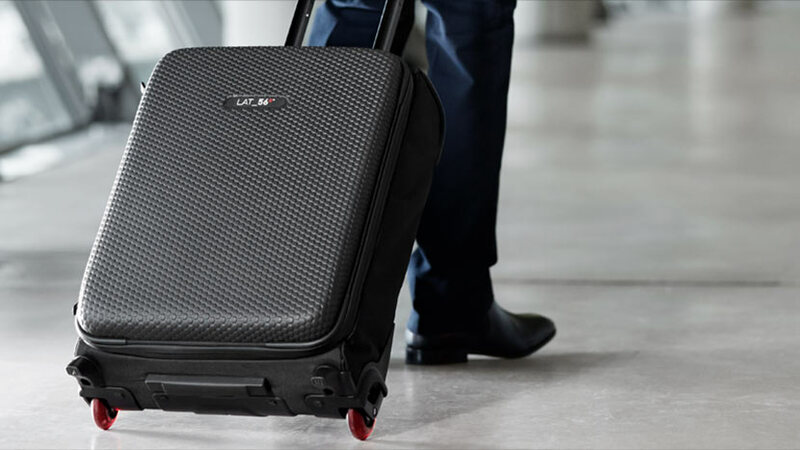 Our aim is to be your personal luggage brand, we hope you’ll be a lifelong customer and so we’ll treat you that way. We recognise our responsibility to the environment and a key part of this is the quality of the products we create and the longevity they deliver. Increased durability means that we as a company consume only what we need and are firmly focused on minimising the impact on the environment. LAT_56 has taken more care in design and manufacture which frees you to concentrate on travelling from A to B. Once you own a LAT_56 product you become an elite status customer instantly. Not only do you get to enjoy using our innovative products which are the best in their class, you also get to experience personal, world-class, after-sales customer service and peace of mind that for five years after you purchase a LAT_56 product from a LAT_56 store or retailer you will be covered by our Guarantee. For the first five years that you own your LAT_56 product, LAT_56 will replace/repair any items that are defective in materials or workmanship, including any structural defects (such as defective handles or zippers). We do not cover damage resulting from wear and tear that is not the result of defects in materials or workmanship. We do not cover damage caused by airlines or other transit damage. Damage claims in transit cases should be filed against the carrier. Other damages not covered are damage resulting from abuse, cosmetic damage (such as scratched leather, nylon, EVA or stained fabrics) and incidental or consequential damages, such as damage to or loss of the contents of a bag, loss of use, loss of time, or similar expenses. The LAT_56 Limited Lifetime Guarantee extends to the original owner; it makes life simple and is part of the overall LAT_56 experience. Please contact us in the first instance. We will most likely ask for some quick pictures (to save you the hassle of sending the goods in) and take it from there. Often, we will replace it extremely quickly and despatch a brand new item at no additional cost to you, with no hassle - or occasionally we may ask you to ship your product to us for further checks and assessment. In those cases where our warranty does not apply, we will promptly provide you with an estimate of any repair. Please save your receipt as proof of purchase. This will be needed to demonstrate your warranty coverage. Additionally, this will serve as proof that your purchase was made at an authorised LAT_56 store. The Limited Lifetime Guarantee only applies to products that were purchased from an authorised LAT_56 store or retailer. How to Get in Touch With Us if You Do Have a Problem? By Live Chat: Click the button in the footer to chat with an online LAT_56 Club Services Concierge. This expert will be able to assist your query with an immediate, real-time response. By Email: Contact us or email [email protected]. Please kindly quote your Order # and Full Name in the subject line of all correspondence. At LAT_56 you will always be able to speak to a real person at the heart of the company to get the service you deserve. Even if you want to speak to the designers of the actual product, we will sort it for you!